The Penn Hills Police Department is committed to providing access to our website to individuals with disabilities. We recognize the importance of making our website and all online facilities accessible by everyone, regardless of their abilities. Section 508 of the Rehabilitation Act Amendments of 1998 requires that individuals with disabilities, who are members of the public seeking information or services from us, have access to, and use of, information and data that is comparable to that provided to the public who are not individuals with disabilities, unless an undue burden would be imposed on the Municipality of Penn Hills and the Penn Hills Police Department. The Municipality of Penn Hills and the Penn Hills Police Department are committed to protecting online users’ privacy. We believe that protection of personal privacy while accessing our web site from the internet is our responsibility. This is done to assure user confidence, increase participation in online activities, and support effective and efficient delivery of services. We do not collect any personal information. If you send us an electronic mail message with a question or comment that contains personally identifying information, or fill out a form that e-mails us this information, we will only use the personally identifiable information to respond to your request and analyze trends. We may redirect your message to another municipal department or person who is in a better position to answer your question. We automatically collect electronically generated information about your visit to our site, such as the date, type of browser used, and technical internet protocol data. We collect this information about each user session from our user logs, and refer to it in summary form for statistical purposes only. We do not use “persistent” cookies to collect permanent or personal information. As a governmental agency, we are governed by public records laws of the Commonwealth of Pennsylvania. Any information that we receive through use of our site is subject to the same provisions as information provided on paper. Otherwise, we do not share personal identifying information with any third party without your permission. 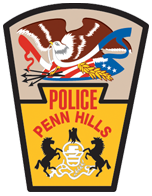 The Penn Hills Police Department website provides links to other websites. They are provided for user convenience only. The appearance of such links do not constitute an endorsement, recommendation or certification by the Municipality of Penn Hills or the Penn Hills Police Department, nor should the presence of such links in any way be construed as having any relationship with the Municipality of Penn Hills or the Penn Hills Police Department. The Penn Hills Police Department seeks to ensure that its website remains available to all users. In this vein, it has taken several steps to safeguard the integrity of its data, and prevent unauthorized access to information it maintains, including but not limited to; authentication, monitoring and auditing. Security measures have been integrated into the design, implementation, and day-to-day practices of the entire operating environment, as part of a continuing commitment to risk management. These measures are designed and intended to prevent corruption of data, block unknown or unauthorized access to our systems and information, and to provide reasonable protection of information in our possession. This information should not be construed in any way as giving business, legal or other advice, or warranting as fail proof, the security of information maintained via the police department’s website. Unauthorized attempts to upload information or change information on this service are strictly prohibited and may be punishable under various statutes including, but not limited to; the Federal Computer Fraud and Abuse Act of 1986 and the National Information Infrastructure Protection Act.